SPECIAL DEAL - Usually 29.95, today just 19.95 - Save £10! 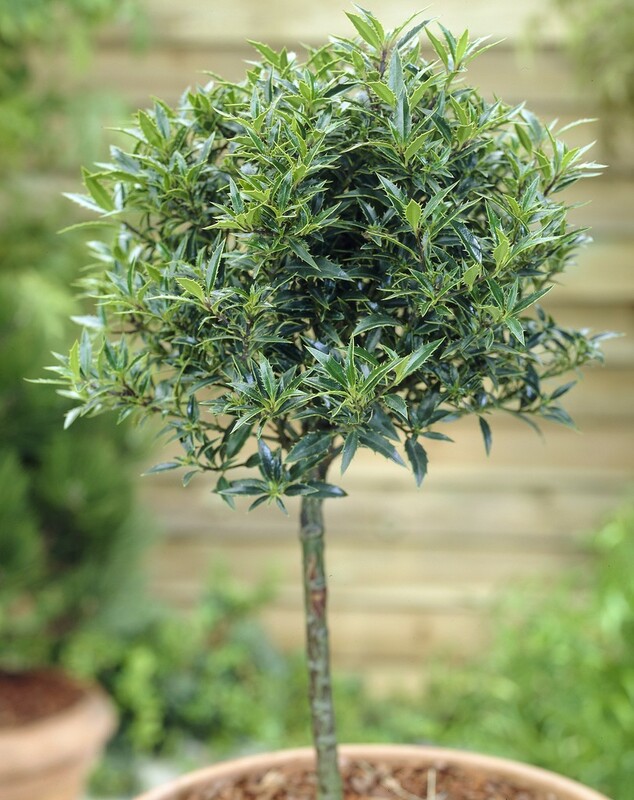 This beautiful standard holly tree has lovely dark green foliage, and will make a classy addition to any patio. Perhaps use flanking a front door to make a swish looking entrance to your home. Supplied with an approx 50cm tall clear stem, topped off with an approx 30-40cm diametre lollipop head. Overall height including pot is around 80-90cms. This distinguished evergreen really is a sight to behold. These trees make a great decoration in the festive season, in a porchway for example as one enters the home. All year round they provide a high-class property enhancing look, and can be used in place of where the popular bay tree is often paraded. Ilex myrtifolia more commonly known as the Prickly Pineapple Holly is a compact growing type with dusky purple young shoots and small, narrow dark green leaves edged in fine relatively soft spines. Dense and slow growing, mytifolia holly is a quite rare,male variety of common holly, and will therefore be a perfect pollinating partner to the types that carry berries in your garden. It can be celebrated as a near topiary with its deep green, narrow, super glossy leaves, or tucked in a corner to carry out it's functional duties with your lady hollies and ensure plenty of berries each year.